In 1993, new coach Dave Wannstedt brought with him his "winning" philosophy. It's funny not because it's a bad philosophy, but because mentioning Wannstedt and winning in the same sentence doesn't make sense. This plan was to run the ball at all costs, play good special teams, and allow the defense to win football games. In essence, a big-time running back was required for this philosophy to work. In '93, Wannstedt began his tenure by stating he believed the team could win with Neal Anderson, an aging back entering his eighth season. Anderson didn't appear to be the solution halfway into that campaign, so the team traded a fifth-rounder to Pittsburgh for Tim Worley. Worley had a fairly successful second half in '93, and looked like he might be the answer. Apparently, Wannstedt didn't think so, as he brought in Lewis Tillman from the New York Giants to be the starter in 1994. During the 1994 playoff campaign, Tillman was a workhorse despite barely averaging 3 yards per carry. Worl ey rarely carried the ball during the year, and was released after suffering numerous mental health problems. A review of the '94 season showed the offensive line, QB and WR positions to be solid, so the 1995 draft, which was deep in top-notch running backs, looked like the year to nab the Bears' back of the future. The top backs coming out of college in 1995 were Penn State's Ki-Jana Carter, Michigan's Tyrone Wheatley, Washington's Napolean Kaufmann, Tennessee's James Stewart, and Colorado's Salaam. Carter figured to be the consensus number one pick overall, and it was anybody's guess how the rest would fall. Salaam figured to be gone in the first 15 picks, and it seemed likely that the bruising Stewart or the quick, flashy Kaufmann would fall to the Bears. Carter wound up being picked by Cincinnati #1 overall, the New York Giants took Wheatley, Oakland took Kauffmann, and Jacksonville took Stewart. The Bears were ecstatic when Salaam was still available at the 21st pick, and the team snatched him up. Wannstedt figured he drafted the back of the future-Salaam stood 6'1" and weighed 210 pounds, large enough to take punishment but still possessing nifty moves and speed. There were questions about his hands and pass-catching abilities, but fumbling never had been a problem for him in college. Wannstedt's running dream now included a backfield of Salaam at halfback and 1994 4th-rounder Raymont Harris at fullback. Harris had suprised everyone with his blocking, receiving and running skills in '94, so he and Salaam would provide a dual threat when paired together. The newly proclaimed savior's problems started in the summer of '95 with a lengthy contract holdout. Salaam finally arrived to make a spot appearance at Cleveland in a preseason game on August 14th. By opening day, Wannstedt still wasn't ready to name Salaam the starter, and Lewis Tillman opened the season at tailback. It didn't take long for Salaam to make his mark, however, as he rushed for 47 yards on 10 carries and scored a touchdown in the Bears 31-14 victory over Minnesota. An unfortunate event occurred in this stirring victory, however, as Raymont Harris was lost for the season on the game's first play with a broken collarbone. Thus, the dream backfield would have to be shelved until 1996. Salaam finally supplanted Lewis Tillman as the starter during week four at St. Louis, and Tillman rarely saw the field for the remainder of the season. Salaam put up great rookie numbers in '95-he compiled five 100-yard plus games and scored 10 touchdowns en route to setting the Bears rookie rushing record with 1,074 yards on 296 carries. He showed better speed and moves than any back on the Bears roster, but another problem in his game began to surface that year as well. Despite the great numbers, Salaam fumbled 11 times in 1995, sometimes without any contact from a defender. Despite the fumbles, Chicago focused on the bright spots, and looked forward to building on '95 with a playoff-bound team in '96. Many things that were expected did not happen in 1996. Erik Kramer was coming off a 29-touchdown campaign in '95, but was lost for the season after a 1-3 start. Massive injuries affected both sides of the ball, and the Bears performance. One of the injured was Salaam, who was hurt in the preseason against Kansas City, after he fumbled on the Chief's five-yard line. The Bears were still eager to showcase the Salaam/Harris backfield, but it would have to wait until Salaam was ready to play against Detroit. As Salaam was injured, Harris and Robert Green were filling in admirably, with each rushing for over 100 yards in games. Then when Salaam was prepared to come back in week four, Harris was injured and missed four weeks. Such was the story of Chicago's 1996 season. Harris played well enough to keep the starting job over Salaam, and the two never hit the field together. 1997 figured to finally be the year to utilize the tandem of Harris and Salaam. Rashaan did open the season as the starting halfback, and for the first two and a half games, he and Harris rotated into the backfield. By game three, however, Harris had clearly won the starting tailback job as Salaam had fumbled several times. In game three versus Detroit, it finally happened. Salaam and Harris were on the field for one play together; it was the only time this would happen. During that game, Salaam fumbled again and broke his leg, ending his season and his career with the Chicago Bears. Prior to the 1998 season, Wannstedt attempted to trade Salaam to the Miami Dolphins for a late-round draft pick, but the trade was rescinded when he failed a physical. After sitting out the 1998 season, Salaam attempted a comeback with Oakland, Cleveland, and finally Green Bay, but he was cut in each city. A Chicago Sun-Times article then revealed that Salaam admitted to habitually smoking marijuana while he was with the Bears for his three seasons. The article seemed to be a fitting finish for a first-round bust, one of several that would plague the Bears in the 1990's. 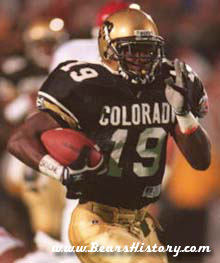 Salaam won the Heisman Trophy, awarded to the best player in college football, following the 1994 season. It was not expected that Salaam would be available to the Bears with their 21st pick in 1995, but after four other backs were picked, Salaam fell to them. He set a Bears rookie rushing record in 1995 with 1,074 yards gained, but also fumbled 11 times. He was one of three Bears to rush for 100 yards in a game in 1996, but injuries kept him off the field the first part of the season. When he was healthy, Raymont Harris had supplanted him as the starter. Salaam broke his leg in 1997 and spent the final 13 games on injured reserve. He later admitted to smoking copious amounts of marijuana that season. A 2005 Chicago Tribune article placed Salaam as a promoter of Chinese martial arts fights.